Some of our activities just don’t fit into any of our traditional activity categories! Those classes can be found here. We have had some camp classes that were started years ago as just a class to add variety. And now years later, they've become camp classics! We also have new and different activities introduced every summer. We also love suggestions from our camp family! Creekers, if you've enjoyed a camp activity that you don’t see on any of our other lists, shoot us an email! We can never have too many activities! Take a look at this hodgepodge collection of camp classes! Just more variety to add to the summer camp experience at Cub Creek! 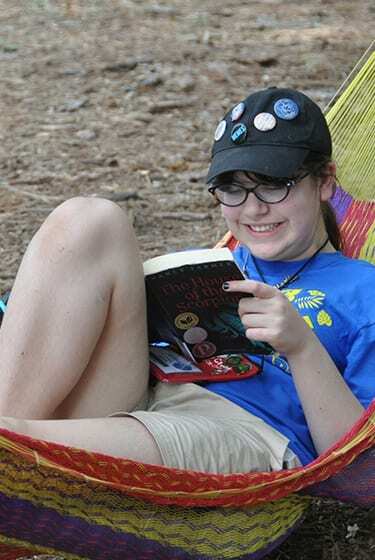 Reading in the Hammocks - This class is usually offered during our two week sessions as a time to relax and enjoy a good book. Swimming - Free swim is a time to play in the pool with friends. This is a great class when it gets really hot in the summer or when campers would like an alternative to their schedule. Can Jam & Bucket Drumming - Campers use metal trash cans or paint buckets to combine beats. Campers enjoy learning different drumming beats and working together to layer sounds, creating a symphony! LARPing - Live Action Role Playing is SO fun! Be prepared to laugh as campers build cardboard swords and shields and battle it out in camps' main field! Disc Golf - Using camps' disc golf set, campers spend the class period playing a round of the game. Trick shots are encouraged! Improv - Spend a class laughing in Improv! Campers will learn games to take back to their cabin and learn how to keep on their toes in this fun class.